Do you need a Facebook page for your business? Twitter? LinkedIn? Before you decide, stop thinking that social media is just for your kids. Social media is hot. Twitter carries more traffic than Google. All the big brands are there. Many politicians, old and young, have been there, from John McCain and Harry Reid to Michele Bachmann and Anthony Weiner. Also, at least seven editors of the Wall Street Journal, have been there as well as stars like Demi Moore, Ashton Kutcher and thousands of NFL football players. Because of the enormous traffic, social media is important to Google. If information is shared between your website and your social media accounts, Google and the other search engines spot the traffic and assume the content to be fresh and relevant. They reward the site with a higher ranking. For that reason, it doesn't really matter if the engineer you are trying to reach is using Facebook to select wire. Because of its higher ranking, he will find your site more easily no matter how he uses the internet. But creating and maintaining social media takes time. Do you have time to Tweet? You have to decide if it is important enough to make time, or if it is important enough to have somebody else in your company make time. It also takes a creative mind and some tough armor. What can you possibly say today that won't offend someone, bore someone or make yourself look silly to someone else? If you can overcome those personal obstacles, there is still the targeting question. Some of your customers are on Twitter, others on Facebook and others on LinkedIn. Others may want email updates from your website. Others may be browsing YouTube. In order to reach all these different customers, you would want to be in all these places, but oh the time! 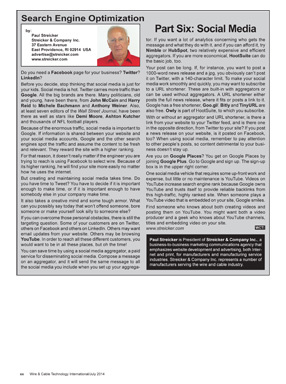 You can save time by using a social media aggregator, a paid service for disseminating social media. Compose a message on an aggregator, and it will send the same message to all the social media you include when you set up your aggregator. If you want a lot of analytics concerning who gets the message and what they do with it, and if you can afford it, try Nimble or HubSpot, two relatively expensive and efficient aggregators. If you are more economical, HootSuite can do the basic job, too. Your post can be long. If, for instance, you want to post a 1000-word news release and a jpg, you obviously can't post it on Twitter, with a 140-character limit. To make your social media work smoothly and quickly, you may want to subscribe to a URL shortener. These are built-in with aggregators or can be used without aggregators. A URL shortener either posts the full news release, where it fits or posts a link to it. Google has a free shortener, Goo.gl/. Bitly and TinyURL are also free. Owly is part of HootSuite, to which you subscribe. With or without an aggregator and URL shortener, is there a link from your website to your Twitter feed, and is there one in the opposite direction, from Twitter to your site? If you post a news release on your website, is it posted on Facebook, too? When using social media, remember to pay attention to other people's posts, so content detrimental to your business doesn't stay up. Are you on Google Places? You get on Google Places by joining Google Plus. Go to Google and sign up. The sign-up box is in the upper right corner. One social media vehicle that requires some up-front work and expense, but little or no maintenance is YouTube. Videos on YouTube increase search engine rank because Google owns YouTube and trusts itself to provide reliable backlinks from this high-traffic, highly ranked site. When someone plays a YouTube video that is embedded on your site, Google smiles. Find someone who knows about both creating videos and posting them on YouTube. You might want both a video producer and a geek who knows about YouTube channels, titles and embedding video on your site. This is the sixth in a series of articles being published bi-mothly in Wire & Cable Technology. Part one is here. Part two is here. Part three is here. Part four is here. Part five is here.